Beggars All: Reformation And Apologetics: Luther: The Biblical Text Never Mattered? Luther: The Biblical Text Never Mattered? This is a startling admission from an unusually pro-Luther biographer. Luther was so intent on ‘discovering’ SBFA in as many places as he could ‘find’ it that he had to ‘find’ it where it didn’t exist. The comment “the text never mattered much to him” should be troubling to Protestants, especially with respect to Luther as a translator of Sacred Scripture, or as a judge of books of the Bible. I'm not troubled by Bainton's quote. Bainton's Here I Stand is arguably the most popular of all Luther biographies in English (perhaps though not the best), and is available free on-line if you snoop around for it. 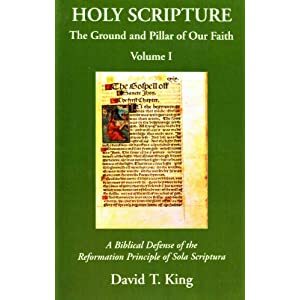 In context, Bainton was saying that Luther could find Paul's explicit theology that "The just shall live by faith" (Romans 3:28) implicitly in the Gospels. That's why Bainton gave the example of the paralytic. Both Protestants and Catholics have a systematic theology. It shouldn't be surprising when a preacher of either persuasion finds unifying themes implicitly where they're presented elsewhere explicitly. That's all Bainton was getting at. Luther's sermons followed the course prescribed by the Christian year and the lessons assigned by long usage to each Sunday. In this area he did not innovate. Because he commonly spoke at the nine o'clock service, his sermons are mostly on the Gospels rather than upon his favorite Pauline epistles. But the text never mattered much to him. If he did not have before him the Pauline words, "The just shall live by faith," he could readily extract the same point from the example of the paralytic in the Gospels, whose sins were forgiven before his disease was cured. Year after year Luther preached on the same passages and on the same great events: Advent, Christmas, Epiphany, Lent, Easter, Pentecost. If one now reads through his sermons of thirty years on a single theme, one is amazed at the freshness with which each year he illumined some new aspect. When one has the feeling that there is nothing startling this time, then comes a flash. He is narrating the betrayal of Jesus. Judas returns the thirty pieces of silver with the words, "I have betrayed innocent blood," and the priest answers, "What is that to us?" Luther comments that there is no loneliness like the loneliness of a traitor since even his confederates give him no sympathy. The sermons cover every theme from the sublimity of God to the greed of a sow. Having read Luther's sermons for quite a few years now, I can testify to the truth of what Bainton is saying. Certainly Luther located the theme that "The just shall live by faith" often in his sermons, but he did far more. You mean the popes at CA let you back in? I am "banned for life" but they still ask me for money. It is good that you continue to misconstruance of Luther. Yet I'm amazed at RCs preoccupation with Luther. Due to their own thinking of men above that which is written in Scripture, and finding security in the former, they seem to think that we must live by every word that proceedeth out of the mouth of Luther. I've yet to be banned from CA. I've been chastised a few times, but not banned. As to RC preoccupation with Luther, as far as I can tell it's only the conservative Internet-type of Romanists who are so concerned. The majority of them (as well as most Protestants I guess) don't care or may not even know who Luther was or what he said.